Are you in the middle of searching for a new car or SUV? Are you interested in Volkswagen’s lineup of models? Then there’s no better place in Green Bay and northeast Wisconsin to get a new Volkswagen than Broadway Auto on Ashland! Broadway Auto has been serving the Green Bay community since 1916, and there’s a reason we’ve been around for so long! We always strive to bring the most reliable and valuable vehicles to customers, and that includes Volkswagen's lineup of cars and SUVs. Whether you need efficiency, space or capability, we can find the right Volkswagen vehicle for you! Plus, our latest lease specials will help you find the perfect Volkswagen for you at an affordable price. Check out our specials and view our inventory to learn more! *To approved credit through VCI on a 2019 Volkswagen Atlas SE 4 Motion with 39mo/32,500 miles and $2,995 down payment. No security deposit. $359/mo includes dealer discount. Tax, license, title and service fees extra. See dealer for details. Ends 4/30/19. *To approved credit through VCI on a 2019 Volkswagen Jetta S with 36mo/30,000 miles and $0 down payment, $0 security deposit, $0, first month’s payment and $0 due at signing. $259/mo includes dealer discount. Tax, license, title and service fees extra. See dealer for details. Ends 4/30/19. *To approved credit through VCI on a 2019 Volkswagen Passat Wolfsberg Edition with 36mo/30,000 miles and $2,995 down payment. Tax, title, license and service fees extra and due at delivery. $279/mo includes dealer discount. See dealer for details. Ends 4/30/19. *To approved credit through VCI on a 2019 Volkswagen Tiguan S 4 Motion with 36mo/30,000 miles and $0 down payment, $0 security deposit, $0, first month’s payment and $0 due at signing. $299/mo includes dealer discount. Tax, license, title and service fees extra. See dealer for details. Ends 4/30/19. 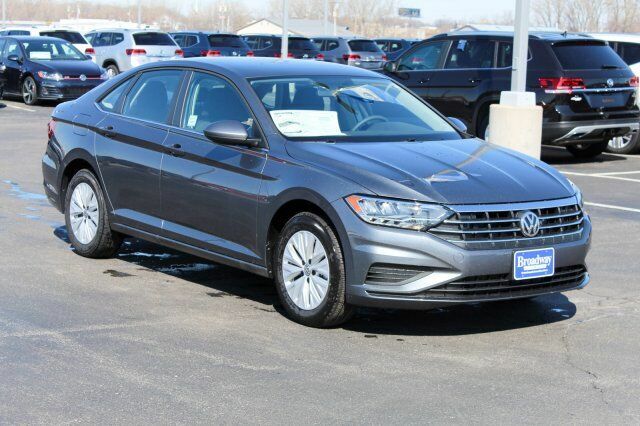 If you’re looking for a compact car that will save you money at the gas pumps but doesn’t' sacrifice performance or style, then the Volkswagen Jetta is for you. This compact is always one of the top-rated in its class thanks to its combination of impressive fuel economy and efficiency while also offering the latest in technology features. Get yours, at Broadway Auto today! The VW Atlas is truly one-of-a-kind in Volkswagen’s lineup as the first-ever three-row SUV from the automaker. It’s also the largest vehicle in Volkswagen’s lineup with plenty of space for both passengers and cargo. Don’t worry, though, it’s not just a box on wheels. The VW Atlas has style, performance and advanced features that make it a hot commodity. If you want something that has more space than a sedan but is more efficient than a normal SUV, then perhaps you should look at the Volkswagen Tiguan. This compact SUV gives drivers solid efficiency while also providing the space and performance expected of an SUV. Efficiency and space, that’s what drivers get with the Volkswagen Tiguan. No matter which Volkswagen vehicle you choose, you can rest easy knowing that you’re getting Volkswagen’s People First Warranty, America’s Best Car and SUV Bumper-to-Bumper Transferable Warranty. Volkswagen’s warranty beats out Chevy, Ford, Honda, Toyota, Hyundai, Kia and Mitsubishi in terms of years and miles covered. With the Volkswagen People First Warranty, drivers are covered for 6 years or 72,000 miles, whichever comes first. The New Vehicle Limited Warranty is also transferable, so if you decide to sell your Volkswagen within the warranty period, the coverage transfers to the new owner at no cost to you! The New Vehicle Limited Warranty covers numerous parts of the car whether, it’s underneath the hood with powertrain components or interior features, so you can be confident that should something go wrong, Volkswagen has got your covered. Want to learn more about Volkswagen and its lineup of vehicles? Contact our staff at Broadway Automotive for more information or to schedule a test drive today!